At this point the last thing I expect from One Piece is a phenomenal video game, but you never know when that Dragon Ball FighterZ moment will hit. 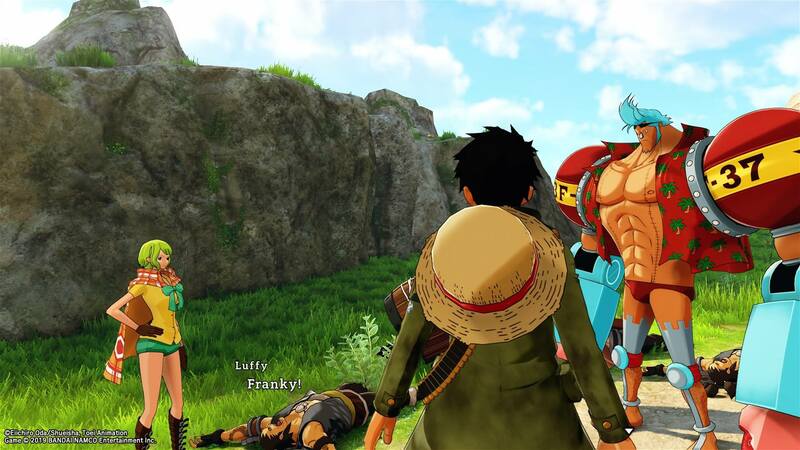 One Piece: World Seeker isn't a particularly groundbreaking open world title. It does tell a pretty solid story for Luffy and the rest of the Straw Hat crew, but only if you're willing to struggle through its repetitive and boring gameplay. 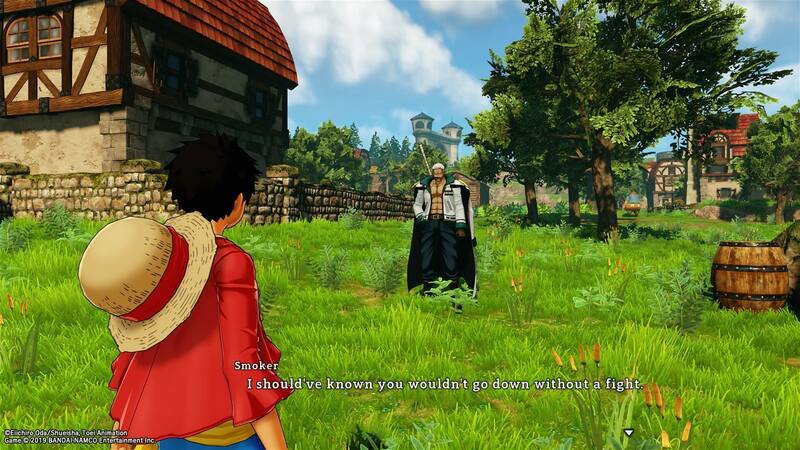 The best part of One Piece: World Seeker is its surprisingly strong narrative. While the pacing is slowed considerably by the insane amount of unremarkable sidequests, the original story, written by Eiichiro Oda himself, delivers two new characters and a decent through line for Luffy and his crew. Things start out with you dropping onto Prison Island. Luffy and the rest of the Straw Hats are here in search of a legendary treasure, said to be held within the island's flying fortress. Things go wrong fast - as they often have a habit of doing for the Straw Hat crew - and the treasure turns out to be a bust. The whole setup was a trap orchestrated by the prison's warden, Isaac. During their escape, our heroes find themselves separated, getting tangled up in a plot involving recognizable pirates and navy officers from Luffy's past, all with Isaac pulling the strings. Luffy ends up allying with the leader of a local anti-navy group named Jeanne. The struggle between the pro and anti-navy islanders - and that between Jeanne and Isaac - is the focal point of World Seeker's story. The big beats could amount to a few solid filler episodes of the anime, though I'd hope those episodes would feature a lot less of Luffy wandering around and picking shiny objects up off the ground. The open world of Prison Island is mostly sprawling countryside and small villages, aside from one major metropolitan city. You'll spend a whole lot of time running back and forth across this map. The gameplay loop consists of two types of mission: fetch a character specified items, or beat up a bunch of random navy or pirate goons. Sometimes you'll even have to beat the crap out of some dudes on your way to retrieve aforementioned items. How you beat the crap out these dudes isn't particularly entertaining either. Luffy can swap between two combat stances. Observational Haki has a focus on dodging and fast strikes, while Armament Haki is all about slow, powerful hits. Later on, you also gain access to Luffy's Gear Fourth transformation. Whatever mode you use the most in combat doesn't really matter, because enemies don't present that much of a challenge. With the exception of armored or flying enemies that might force you to use some ranged attacks, you can basically just spam the punch button until everything is dead. The skill tree offers up a few new abilities like Gum Gum Bazooka, but it doesn't do much to shake up the way you fight. It's more important that you fully upgrade your Rocket and UFO abilities as soon as possible, or else getting around the island can be something of a headache. On the subject of traversing the island, it can be pretty entertaining once you've fully upgraded your Rocket ability, but it still lacks the precision and flow of games like Spider-Man. You can launch yourself pretty far, but it's hard to land exactly where you want to be or keep yourself in the air for very long. Most of the time Steele City, the area that looks the most fun to swing around in, is riddled with Navy snipers that will gun you out of the air without much effort. The lackluster gameplay and bogged-down pacing of the story might have seen some improvements had the full cast of characters been more fully utilized. 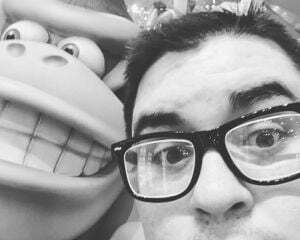 Monkey D. Luffy is a great character, but One Piece has never been just about him. 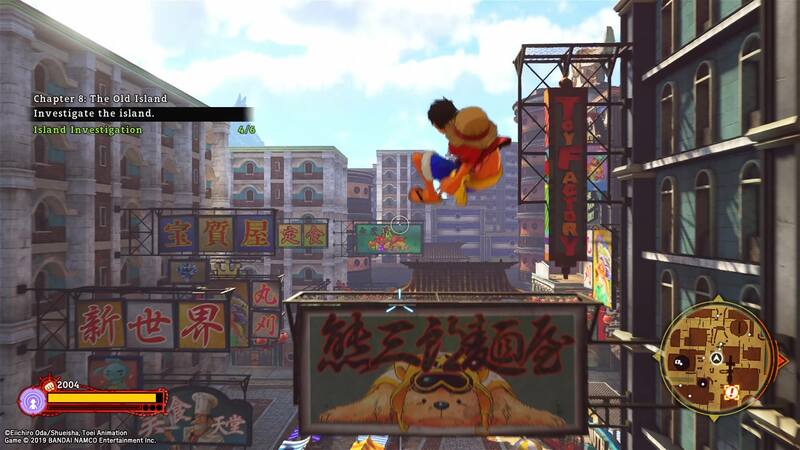 World Seeker could've benefited from exploring gameplay elements from multiple Straw Hat members. 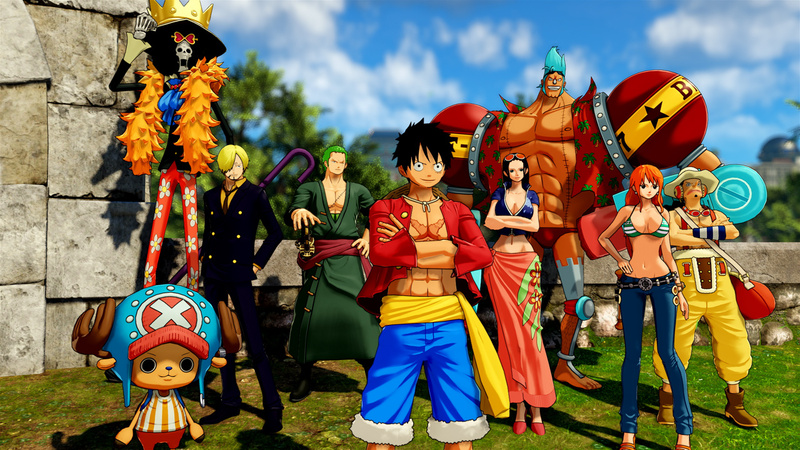 Having every one of them playable might be asking too much, but at the very least having the group's three heavy hitters, Luffy, Zoro, and Sanji as playable characters seems within scope. This variety could have made for some more entertaining story beats. Simply running into the crew members doesn't give them a lot of time to shine. There are a few sidequests centered around the locals mistaking Brook for a ghost and one that plays off the running gag that Zoro has no sense of direction. Aside from these notable moments the other Straw Hats only pop up to ask random tasks of you, except for Sanji who can dispatch other crew members to gather crafting resources, and Franky and Usopp who act as living, breathing crafting stations.